I just received 2 very interesting japanese 12". 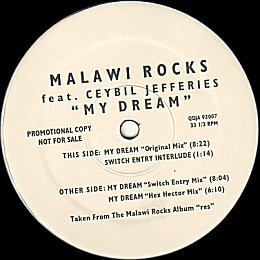 The first, i'm very excited about, is for a Hex remix i thought unreleased until a friend of mine in Japan stumbled upon that "out of nowhere" copy of MALAWI ROCKS feat. CEYBIL JEFFERIES' "MY DREAM". 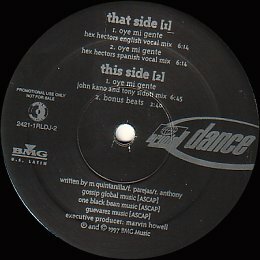 This 1998 promo 12" features a pretty good Hex Hector Mix clocking at (6:10). Rather short but still sounding very good and full of energy. I'm very happy to add another "hard-to-find" mix to my collection. Click the pic to hear a sample. The other 12" i got is from popular japanese singer MISIA that Hex described as one of his favorite voices. I knew he had remixed her single "UNFORGETTABLE DAYS" but i didn't know that this vinyl existed and that it featured the Instrumental Club Mix. Click the Pic for more details. Talking about Japan, i went through the japanese artists pages of my site to clarify them a little bit. I added more catalogue numbers, new pics and more general details. I hope you'll enjoy. HEX HECTOR Feat. JENNIFER C "Deliverance" and another track called "Open Your Heart", this last one apparently done for a "Queer s Folk" record. Check Jennifer's official web site. Hex also remixed japanese pop artist AMI SUZUKI's new single called "Hopeful" on AVEX records. The single release is planned for march. For those of you who, like me, don't know much about her, here's an interesting article i found about her recent history : click here. I found a double 12" promo featuring Hex mixes i didn't have of RALPH ANTHONY's "Oye Mi Gente". These 12" feature the Hex Dub, Spanish and English Vocal Mixes. So far i only had the CD single that has the "Hex Hector Miami Mix" and the "Hex Hector's In Da House Mix" (same as the Spanish Vocal Mix from these 12"). I found the Dub Mix really good so i posted a sample for you to get a glimpse of it. Click the Pic to reach it. 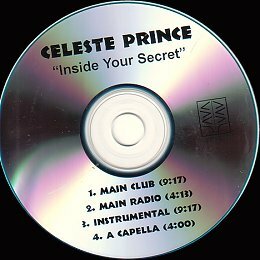 I also got a promo CD of "Inside your Secret" by CELESTE PRINCE. I already had this Hex produced track on vinyl but this promo features same tracks as the 12" plus the Radio Mix. Last, but not least, the Hex Hector Club mix of SABRINA JOHNSTON's "Yum Yum", which i thought unreleased so far, was actually issued by ERG, a DJ only music subscription service, on one of their compilartions called NU DANCE TRAXX #21 !! Thanks to Ron who shared the info (and the mix ;-), i posted a sample of this Hex and Mac mix. Do not expect some big room sound here. This remix is rather mid-tempo, with lots of organ and piano sounds. None of their best in my opinion. Check by yourself here.